Despite the expression on my face, I am extremely happy with this one – my final sweater WIP, Arielle by Kim Hargreaves. 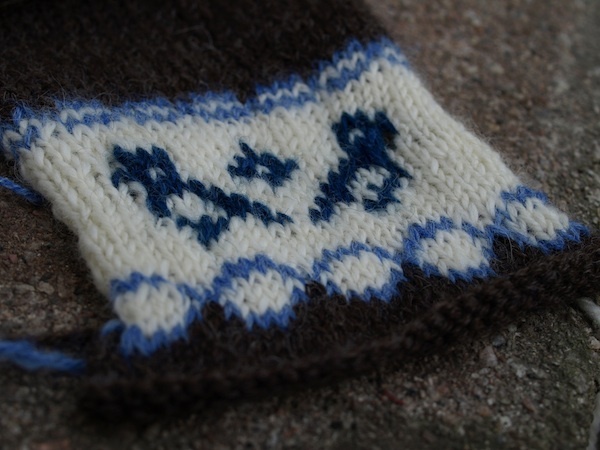 The yarn is Araucania Ranco Solid, and I was a well-behaved-knitter on this project and alternated the skeins. 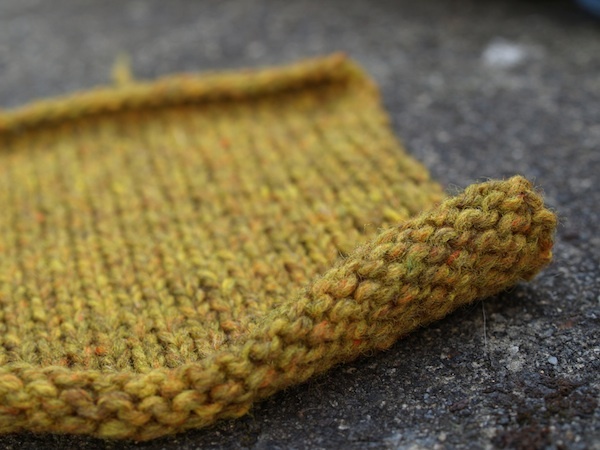 It was the edging that tried to defeat me – I found the sideways band really tedious and seemed to take just as long as the rest of the sweater. 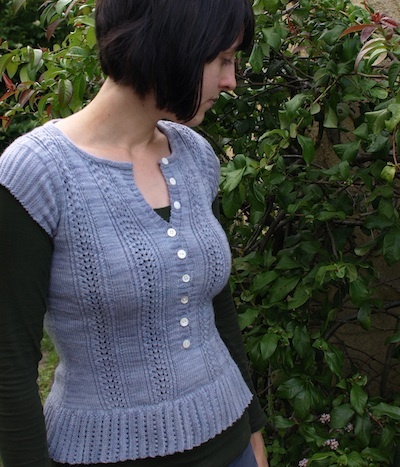 Usually I’m a process knitter, but for this it was always the finished garment I wanted so I’m glad I persevered! The buttons are mismatched, and one of my favourite things about Arielle. From now on Ysolda will be making all my button decisions. In the end it didn’t take that long and I did knit most of the body in just a few days. But it came off the needles so I could work on something else (Laika, maybe?) and fell to the bottom of my basket. Finally finished though, it is perfect. I love the length, the colour, the style, the fit, the buttons, and how beautifully light and soft it feels. The yarn is Old Maiden Aunt Merino Laceweight, and the pattern is Gudrun‘s, from Shetland Trader Book 1. I just wish I had finished this sooner, hopefully I’ll get some chances to wear it before the weather turns. Arielle – finished! It’s soaking, so pictures will follow soon. And thank you for all the nice comments about my swatching – I’m going with my instinct (and fridica‘s advice), that the contrast between the body colour and the natural BFL is a bit much, so I’m going to hunt for something more subtle before I cast on. My four sweaters are almost complete, the last one is on the needles and I’m dreaming about what to knit next. As a reward I let myself knit a couple of swatches. Technically that’s not casting on a new sweater, right? First, was a swatch for my handspun Chickadee, a sweater I’ve been talking about knitting for months but not done much about. During my wee spinning spree a couple of weeks ago I finished up the final contrast colour, and while not all of the main body yarn is spun up yet, I think starting this project will give me the impetus to get back to my wheel. In my head this was going to be the most beautiful sweater I’d ever knit, but now the swatch is done I’m not sure if there’s too much contrast between the colours. (The dark brown for the body isn’t quite as dark as shown, its more of a rich dark chocolate colour.) Please let me know what you think! dark brown – natural corridale, pale blue – shetland, white – undyed blue-faced-leicester, dark blue – BFL dyed by me! And then the lovely Levenwick, which soon will be mine…I swatched in some leftover Shelter I bought in Portland on holiday earlier this year, and then my yarn arrived today. 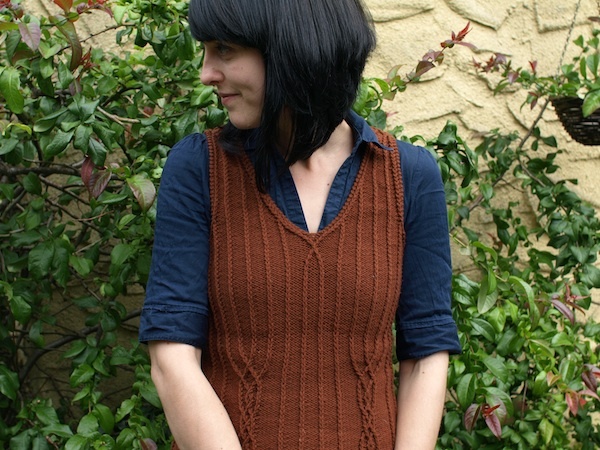 My sweater will be in the Embers colourway, one of the most amazing burnt red/orange/brown colours I’ve ever seen. It is done! Pictures of this have been a little tricky, and it started pouring with rain before the back could be photographed. You’ll need to believe me when I say it’s pretty. Angostura has always been my absolute favourite design in Little Red in the City. The yarn is Quince and Co Lark, in Gingerbread. 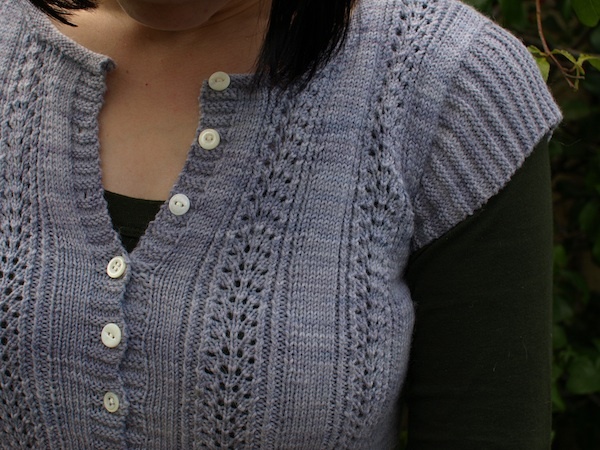 And the wee cable at the base of the neckline makes me super happy – yay for slipped stitches and cables! 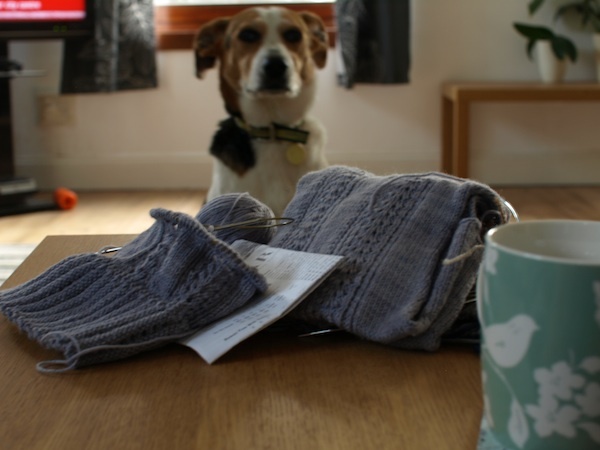 Arielle – this has progressed from me looking out the needles I needed, to actually going into a project bag. Does that count as working on it?